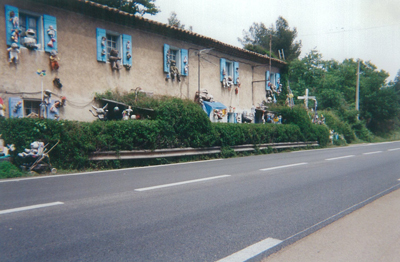 Just outside the community of Gardanne on the road (D7) to Luynes in the Provence area of France, one could drive past a house with a decorated facade. Francis Barale (19??) was the author of this project. A local Gardannne magazine from early 1998 has the story, reporting that Barale at that time was retired and had over twenty grandchildren. So I suppose at that time he was in his sixties, and was born in the thirties of the former century. 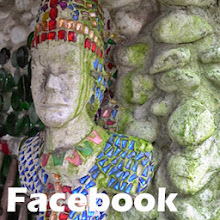 Barale has been a gardener and he has worked in a touristic pottery shop in Valabre, making and selling tiles and other touristic items. He told the local journal he is "attached to things", and he does not like throwing away objects. 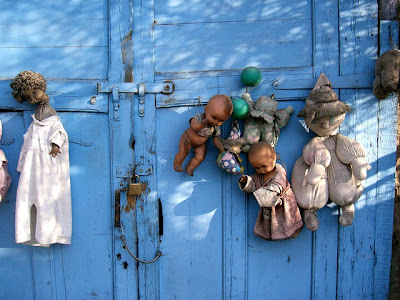 So in the garden of his house he made kind of an exposition of many objects, mainly childrens toys, and he abundantly decorated the facade of the house with dolls, in this way producing quite decorative scenes, as next pictures show. Francis Barale told the journal: "When my grandchildren do not use their toys any more, I ask them to give them to me, and when they visit me, they enjoy themselves (---). 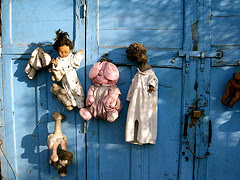 It gives them pleasure to see them there, exposed"
Hi Henk... any idea why the dolls were removed ? By choice or by order ? Something like La Demeure du Chaos which the town hall is trying to have cleaned up ? Hope you are having a fine summer ! Hi Owen, I guess it doesn't have to do with some demand from authorities, but hope to know more about this soon from a contact over there. I very much liked your pictures and stories of the Causes, have been travelling there myself many times, wonderful nature.